Have you often wanted to show your support for our military men and women overseas by sending them something special, but don't know any personally? Whittington's Jerky is pleased to announce that we have been able to make contact with a network of military Chaplains and Chaplain's Assistants to help distribute Jerky to our military. They pay particular attention to soldiers who have little or no support from family or friends at home. If you would like to send a pound or more of jerky to a soldier to show your support for our troops, give us a call and we will be happy to take your order and pass it along to our network of military chaplains to distribute to a soldier who will really appreciate knowing that someone is thinking about them. . . We normally ship jerky in 4 oz. packages, for this special "JERKY FOR ANY SOLDIER" program, we will be shipping our jerky in 2 oz. packages so it can be distributed to more troops. 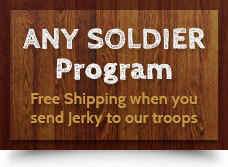 We are also offering FREE SHIPPING for our special "JERKY FOR ANY SOLDIER" program. Call us during normal business hours, seven days a week and we will be happy to assist you. Monday - Saturday: 9 a.m. to 5:30 p.m. If you would like to place your order ONLINE, please use the CODE anysoldier at checkout to receive free shipping and to let us know that you want us to include your order in our "JERKY FOR ANY SOLDIER" program. (Just use your own address as the shipping address - we will take care of getting it to the right people to distribute the Jerky. By using the anysoldier code you agree to have your order of jerky included in our "JERKY FOR ANY SOLDIER" program. Your jerky will be sent to our network of chaplains for distribution to the troops.
. . . I am serving as the Chaplain Assistant for the . . . in . . . Iraq. I recently received a box of delicious Whittington’s Jerky. Of course the contents didn’t last long. Not many people were familiar with your product but you have left a great impression. The Chaplain is from Texas and agrees your Jerky is some of the best. The troops who pound ground outside the wire eagerly accepted your donation and were blown away by the quality. On behalf of the soldiers of the . . . , "Thank you." I’ve read your website and am both impressed and awed by your support. Thank you.